Could 'Carpetbagging' Sink a California Conservative? 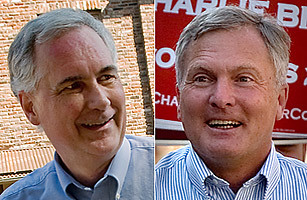 Tom McClintock, left, and Charlie Brown, right, are running for California's 4th District House seat. The citizens of northeastern California's lush 4th district, which roams from the wealthy suburbs of Sacramento through rural outposts in the Sierra Nevada mountain range to the border of Oregon, are heavily conservative. Registered Republicans here hold a 17 point advantage over Democrats, and President Bush won the 2004 election by 24 percentage points. "The fourth district is pretty homogenous," says Tony Quinn, co-editor of the nonpartisan California Target Book. "It represents an unusual part of the statethese people moved up here to get away from California and socially liberal politics." But after 17 years of solid Republican representation, the district can no longer get away from a tightly contested race for Congress. Representative John Doolittle, who is under federal criminal investigation for alleged ties to the Jack Abramoff lobbying scandal (he has denied any wrongdoing), is stepping down. And thanks to the national mood favoring Democrats and accusations of carpet-bagging against the Republican in the race, the contest to fill Doolittle's seat has become one of the country's most heated this election year. At first glance, the district would seem to be an easy win for Republican State Senator Tom McClintock, who is battling retired Air Force veteran Democrat Charlie Brown, who narrowly lost to Doolittle in 2006. McClintock has represented the 19th district in Southern California as a state senator since 2000 and has long been a hero to fiscal conservatives in this state. He served in the California Assembly for 14 years, ran twice for the office of state controller and ran for governor during the Gray Davis recall election of 2003. He is staunchly opposed to taxes (he was a leader in abolishing the state's car tax), claims to be "absolutely opposed" to the $700 billion bailout passed by Congress and is against gay marriage. He is also a vocal critic of Governor Arnold Schwarzenegger, opposes amnesty for illegal immigrants and favors offshore drilling. But, in this close-knit community, McClintock has one big mark against him: he is an outsider. McClintock, who is being forced out by term limits from state senate position, currently lives in Thousand Oaks, just outside Los Angeles (400 miles away from the district). Oddly enough, since he has to remain living there in order to keep his current seat until December, he will not even be able to vote for himself in the race for the 4th District this fall. (California legislators must live in the district they represent, but there is no such requirement for House members). With that odd arrangement, it's no wonder that Charlie Brown has lambasted his opponent as a "carpetbagger" while stressing that he is a longtime area resident who has lived in Roseville since 1991. Brown, a registered Republican until 2005, has also touted his own conservative leanings. "Charlie Brown is a very different Democrat," says his campaign manager Todd Stenhouse. "He's been a gun owner since he was 11, he supports forest thinning, he supports nuclear power, and he believes we should build more oil refineries. He's hardly a stock-and-barrel Democrat." To underline this point and appeal to shifting Republicans and Independents, Brown has pushed the tagline, "patriotism before partisanship". Still, Brown does espouse views that are not exactly appealing to the right. Beyond expressing his support for Washington's $700 billion bailout, he proposes taxing oil companies to raise money for new energy sources, supports universal health care coverage and, perhaps most distasteful to voters, he opposed the troop surge in Iraq. Yet even on the Iraq issue, Brown enjoys an advantage. He spent 26 years as a helicopter pilot for the Air Force and his son is about to enter his fifth rotation in Iraq. One of his campaign slogans is "National security is a Brown family business." In a region with a large veteran population, this is an appealing campaign plank (as is his promise to donate 5% of every fundraising dollar to help veterans). The Republicans are doing their best to neutralize Brown's military background by bringing up an old accusation that cropped up during the Doolittle campaign. In a new television ad, McClintock shows a video that he says proves Brown is a radical who comingledin uniformwith antiwar demonstrators at a 2005 event in Sacramento in which a soldier was hung in effigy. Brown's camp claims he spoke to both sides that night and he was not in uniform (they say he was wearing an old hunting jacket). "He didn't wear it to go hunting, though, he wore it to a highly politicized antiwar rally," says Bill George, the McClintock campaign communications director. "He was not an observer." Stenhouse shoots back: "Tom McClintock is more concerned about Charlie Brown's wardrobe than our economy, our borders, our broken economy or Iraq." In these final weeks, that skirmish is just one of the down and dirty tussles between the two candidates' camps. Brown accuses McClintock of plagiarizing information from Brown's Web site; McClintock has retorted that Brown stole images from news organizations for mailers. Brown is trying to link McClintock's staff to the beleaguered Doolittle; McClintock suggests Brown return campaign money he received from Democratic congressman Charles Rangel, who has admitted failing to pay back taxes and is currently being investigated by the House ethics committee. The opposing campaigns have each recently released polls boasting to be five to eight points ahead of the other, and the liberal Daily Kos blog hired Research 2000 to conduct an independent poll in late-September. The results were a bit surprising: Brown was favored 46 to 41. "Winning this district would be a political shocker," wrote Daily Kos founder Markos Moulitsas in his blog. "Keep this in mindonly five Democrats (out of 236) hold seats more conservative than this one." But Pollster.com's average of polls put the race in a virtual dead heat. And in the end many analysts believe McClintock still has an advantage based on the simple fact that he lines up better with the district's strong Republican values. "McClintock has lost races when he's run statewide because he's too conservative for this state," says Wesley Hussey, assistant professor of government at California State University, Sacramento. "But this district is not the state." Next Races to Watch: Will the Netroots Sink a Microsoft Dem?